I would sooo love to do this! Live in an entirely sustainable and environmentally conscious village where everyone holds the same respect for our environment as I do. What a dream it would be. Ecovillagesis a brief investigation into Ecovillages, how they work and what previous knowledge and experiences have been used to form the utopian-like community of eco-awesomeness. Using the past to form your future isn’t always a bad idea as long as you use it to move forward and not hold you back. A large part of why many eco-solutions don’t work on a large scale is peoples abhorrence to progress and their dependence on the past to keep them going. The past is the past for a reason, not because of time but because of innovation. 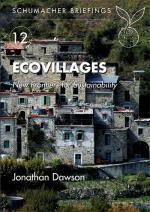 Ecovillages are the wave of the future. They may be small in size now but fingers crossed eco-innovations will entice the masses to do the right thing and respect our world as much as they respect their money. In the last twenty years ecovillages—local communities which aim to minimise their ecological impact but maximise human wellbeing and happiness—have been springing up all over the world. They incorporate a wealth of radical ideas and approaches which can be traced back to Schumacher, Gandhi, the 1960s, and the alternative education movement. This Briefing describes the history and potential of the ecovillage movement, including the evolution of the Global Ecovillage Network and the current developments in both North and South. In an age of diminishing oil supplies, the Briefing examines the lessons that we can learn from ecovillages about how to live in a more ecologically sound and sustainable way.